Hi, Todays miniature from my Rogue trade collection is Female Warrior Gabs of the Adeptus Sororitas, a possible forerunner for the Sisters of Battle range. You can see the original advert over here on Solegends RT 601 Adventurers. Here is my painted miniature armed with a sword and Bolter and standard marine design power armour. What I love about this miniature which is not evident in the photo is that the female power armour has high heels, now the breast plate is understandable but high heels, it would be like posting a modern British female soldier out to Afganistan in high heeled assault boots. I still have to get round to painting up the other miniature Female Warrior Jayne. 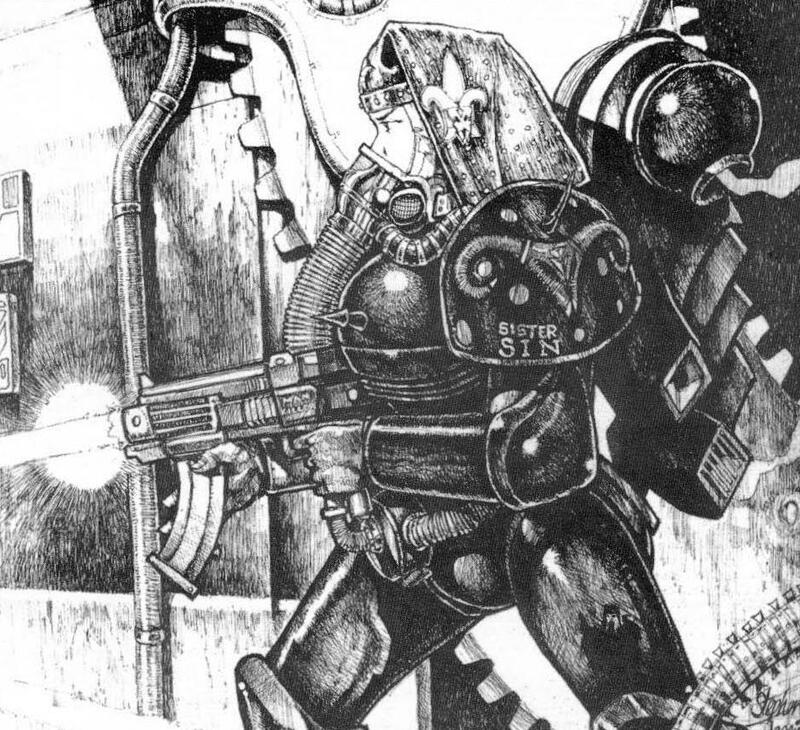 Art from the Rogue Trader rulebook portraying a Adeptus Sororitas, not too far away from the miniature but a bit more of a 'Nun with a Gun' don't you think? 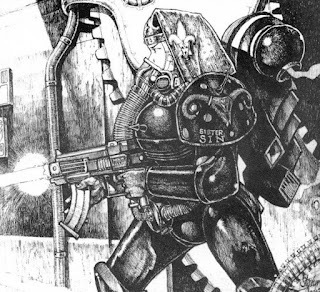 I am not quite sure what the rams skull signifies on both the miniatures and the illustrations shoulder pad but I am hoping one of you will tell me. Nowadays, the ram's skull is used as the symbol for Space Marine Librarians. Back in the day, they probably used it because it was METAL. You could perhaps say that it denotes a character with psyker powers? Hey Chris, thanks for your comment, i do have several RT space marine librarians with rams skulls on their shoulder pads as i think you are right was this a mistake made by the minature designers? I don't recall any fluff referring to the original sisters having any psychic powers in the more recent fluff it would be deemed heretical. 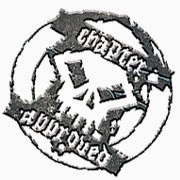 When you say METAL do you mean a heavy metal reference which influenced rogue trader heavily as most the gw staff were metal heads? Yeah, I was being flippant :D with the metal, but RT is pretty ott heavy metal. Remember that figure was originally offered as "Female Space Marine" it was later changed to Female Adventurer in Power armor or something like that. 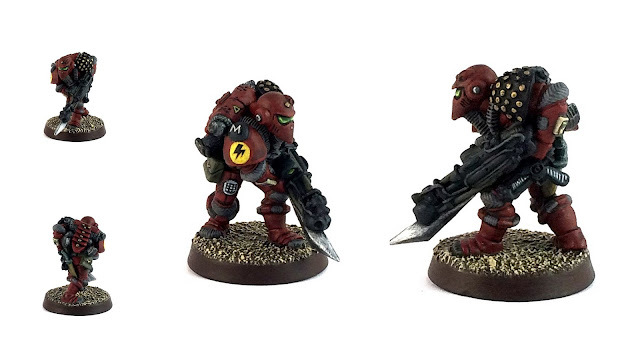 I still believe that there were supposed to be female Space Marines, but someone at GW changed their minds. Probably due to the costs of making female gendered Marines or they didn't care for how this figure turned out. GW has had real problems making decent looking female figs thoughout the years. The Sisters of battle as we know them now. 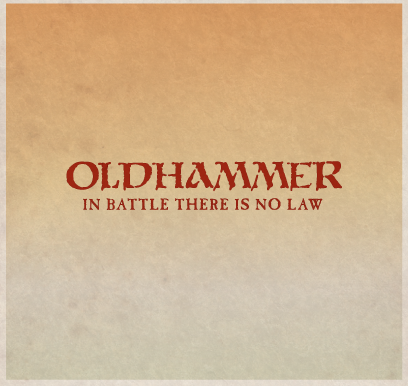 Didn't come into being till 2nd edition shipped. Thanks Tasha, thats interesting, being a adolescent male at the time, I think I would have appreciated more female miniature scuplts I think GW saw a cash cow with the release of the SoB aimed at teenage boys.